There is no bad time to explore this coastline but wildlife sightings inevitably vary according to season and tides. 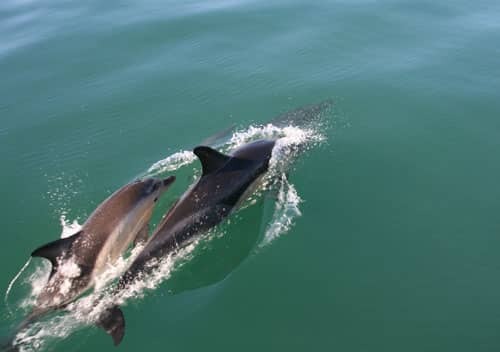 The Pembrokeshire coast and islands are always stunning and our skippers have learned over the years to predict what wildlife is likely to be around but often the most exciting encounters are unpredictable; we will do our best to make the most of your trip. 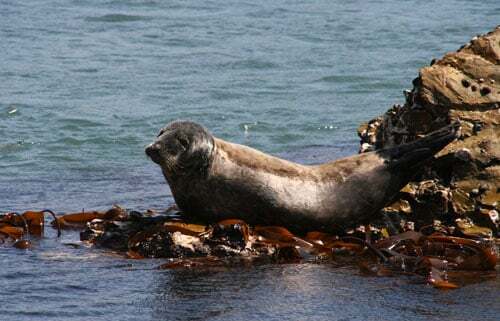 You will see (depending on sea conditions and season): seals; thousands of nesting seabirds, including Guillemots, Razorbills, Puffins, Kittiwakes; Gannets, Chough, Peregrine Falcons, Buzzards; porpoises, even dolphins, whales and sunfish. In order to minimise possible disturbance we are careful about speed and angle of approach and ask that passengers avoid making sudden movements or noise when close to wildlife. Seals are around all year but breed in late summer / autumn. Late August to October is the best time to see new born pups but yearlings (last year's pups) are around all year. Seals are naturally curious, with an intelligence level similar to that of dogs. Young seals in particular enjoy people watching and playing in the jet stream. Ramsey is home to the largest breeding Atlantic grey seal colony in southern Britain but we receive occasional visits from common seals. Dolphins feed in the rich waters of the Celtic Deep. They are generally found in the summer months off Grassholm, The Smalls and the Celtic Deep and are occasionally spotted inshore around Ramsey or the Bishops and Clerks. Common and Bottlenose dolphins may be the best known but we see Risso's regularly too. Porpoises are around all year. 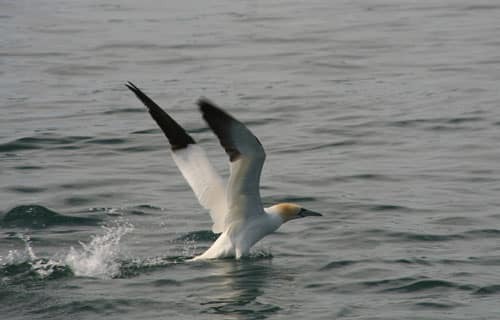 They are more likely to be sighted in Ramsey Sound when the tide is running south and blocking fish heading north, providing good feeding (Gannets are often sighted fishing in the same area). Please note that the tide in Ramsey Sound turns approximately 3 hours after high and low water times indicated in tide timetables. 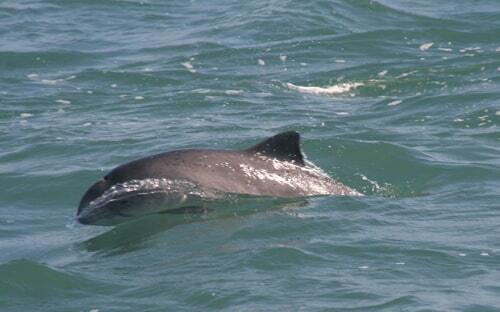 Porpoises can also be seen around St David's Head on the northerly tide. Birds May to early July is the best time for seeing thousands of Kittiwakes, Razorbills, Guillemots and Puffins (North Bishop). Oystercatchers, Fulmars, Shags and Cormorants are around until September. Chough, Peregrine Falcons and Buzzards are resident. Gannets, which breed on Grassholm, are daily visitors. Shearwaters feed out at sea during the day and return to the islands in the early evening. We are members of the Pembrokeshire Coastal Forum, which seeks to promote best practice in relation to tourism and coastal management. This keeps us informed of the latest environmental initiatives, which we fully support. We were involved in the consultative process in drawing up best practice guidelines for activities around seals, birds and cetaceans. We are also accredited by the national WISE scheme for boat operators working around marine wildlife.